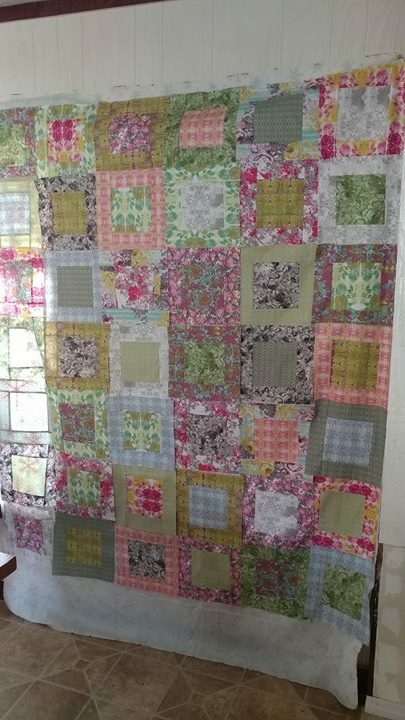 Leanne started a block drive to collect quilt blocks that could be assembled into quilts. The simple box block finishes at 10" (see her blog for how to make the block). This would allow for an arrangement of 6 blocks by 7 blocks to create a 60" x 70" finished throw size quilt. 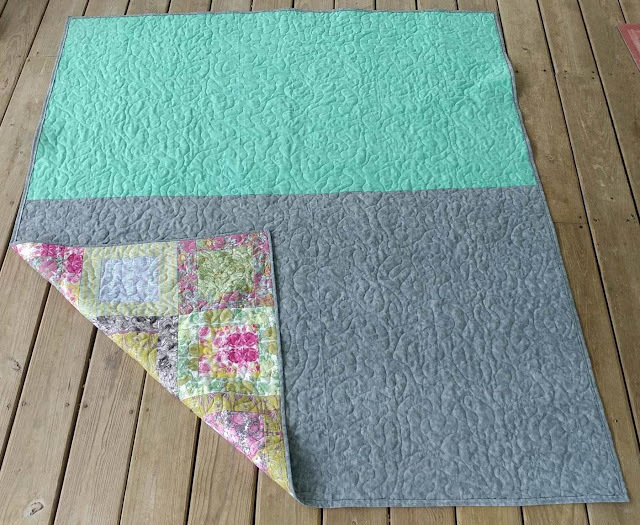 Each quilt would need 42 blocks. Multiply that by the 21 residents, and Leanne needed 882 quilt blocks! I immediately committed to making one whole quilt. After just a couple days, Leanne had received enough commitments from quilters to exceed what was needed!! Be sure to watch her blog/Instagram/Facebook for updates on her efforts! 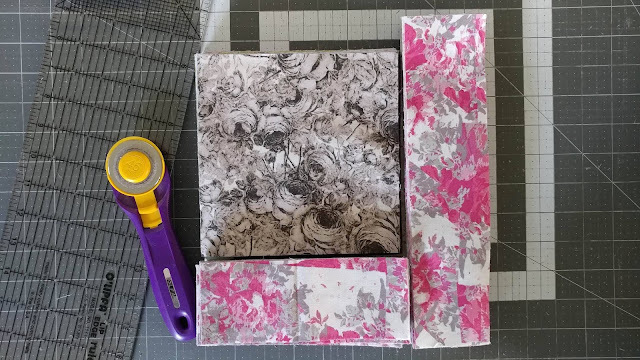 For my 42 blocks, I started with a fat quarter bundle of Rose Water Fabric by Tina Givens for Free Spirit fabrics. 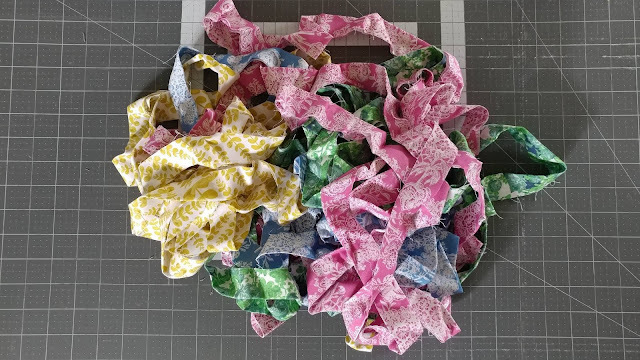 I won the fabric from Melissa at 100 Billion Stars, so it was the perfect opportunity to Pay It Forward! 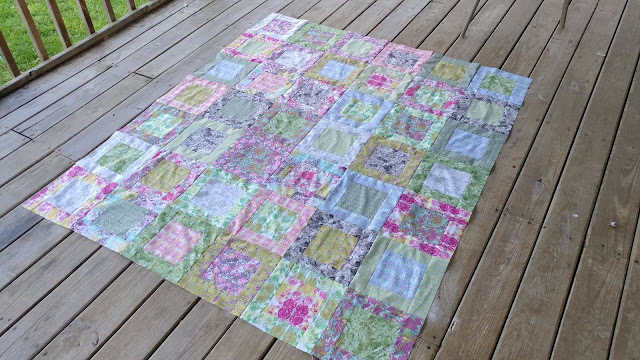 The blocks came together quickly with chain piecing. 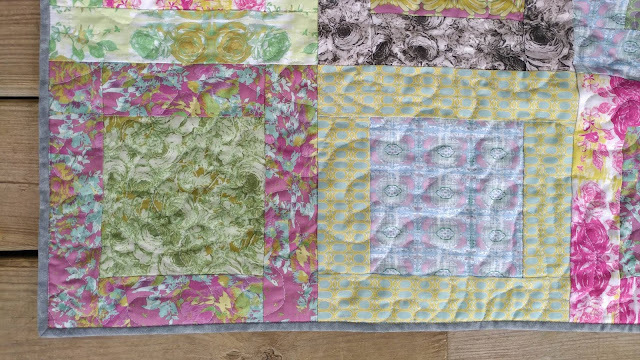 I even figured out that if I used my automatic thread cutter on my Juki TL-2010Q in-between pieces, I could save even more time since I didn't have to cut the pieces apart with scissors! For the back, I had a couple scraps of extra wide backing fabrics in my stash. 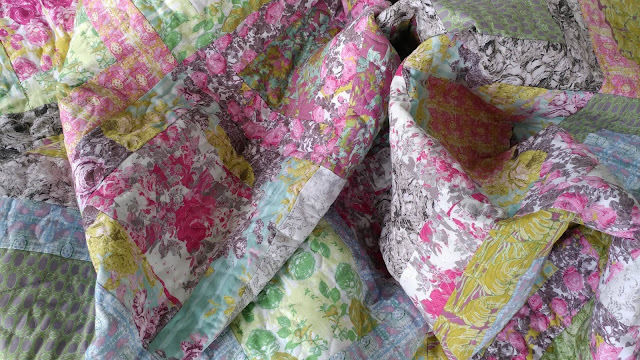 They are a mottled tonal fabric from my local quilt shop. After sewing them together, they were the perfect length - by just a couple inches! 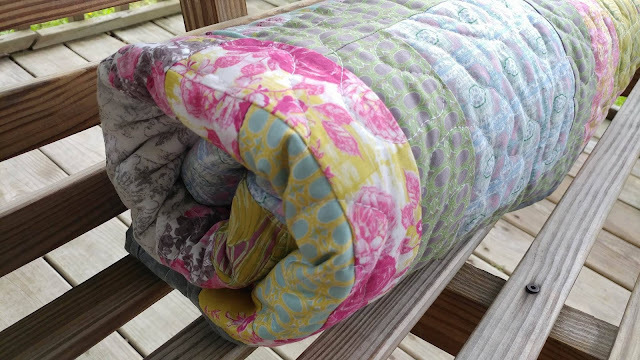 I pin basted the quilt sandwich and quilted it on my Juki. I used a large meandering stipple design with white thread. 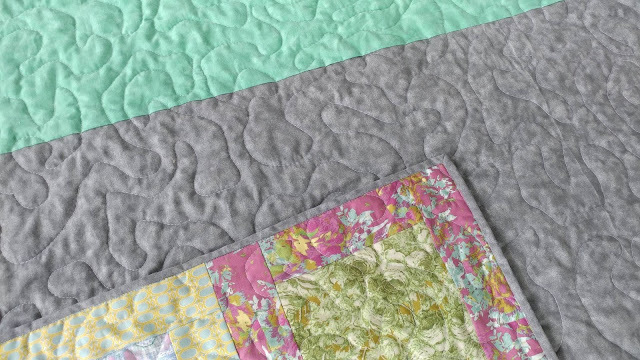 I used the leftover gray backing fabric to bind the quilt. Of course as soon as it was finished I found the pile of binding I had already made - all 23 yards of it! D'oh! I printed a label onto white fabric with my ink jet printer. I ironed Heat-N-Bond to the back first, then printed on it just like I do paper. Then I ironed it onto the back of the quilt. I've done some minor testing of this method before, and it's not very colorfast. I'm sure it will fade with each washing. However, I really like the crisp look for the initial gifting, so I ignored my own warnings and did it anyway. Now I just have to figure out how to mail a quilt to Canada! And I'll add my 23 yards of binding to the box! That will be enough to bind three more quilts! 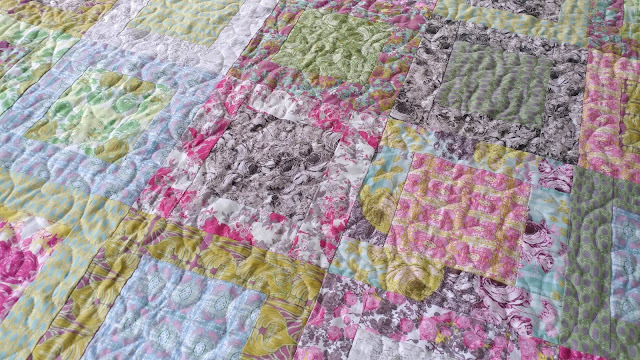 This is my 13th quilt finish for the year! 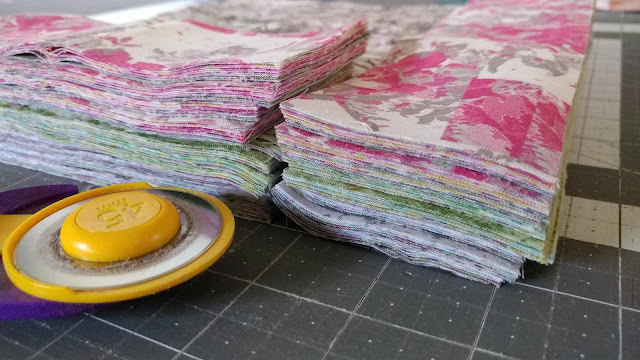 Linking up with Let's Bee Social at Sew Fresh Quilts, Needle and Thread Thursday at My Quilt Infatuation, Can I Get a Whoop Whoop at Confessions of a Fabric Addict, Finished or Not Friday at Busy Hands Quilts, TGIFF at Charly and Ben's Crafty Corner, and Finish It Up Friday at Crazy Mom Quilts. Laura that turned out wonderful. I am sure one of the residents will be so thrilled to have this quilt. 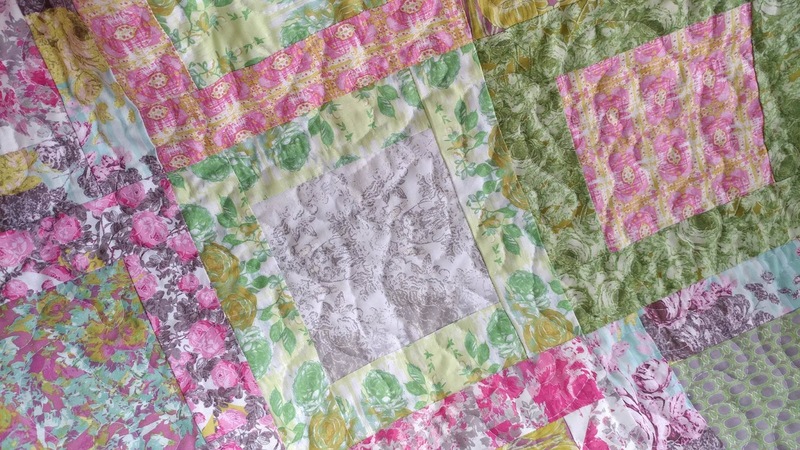 What a beautiful quilt for such a wonderful cause! I am sure whoever gets it will feel very comforted by it. Beautiful quilt!! I mailed my blocks today with a couple of things I thought she might need, like needles and a bit of cash for thread. Very pretty! Those seniors need a blessing, and this will be a tangible one. 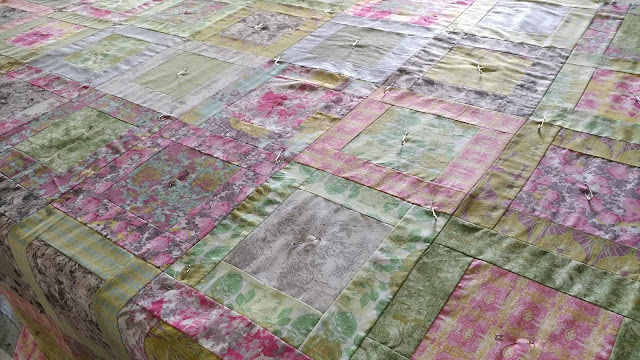 Great job finishing 13 quilts so far this year, too! Wow! You made that quilt fast! It seems like just a few days ago I heard about this project. I was going to make some blocks to send but it sounds like there is no need? I will go ahead and make them anyway and I'll have some ready for the next time something like this might happen. Your quilt is really pretty. 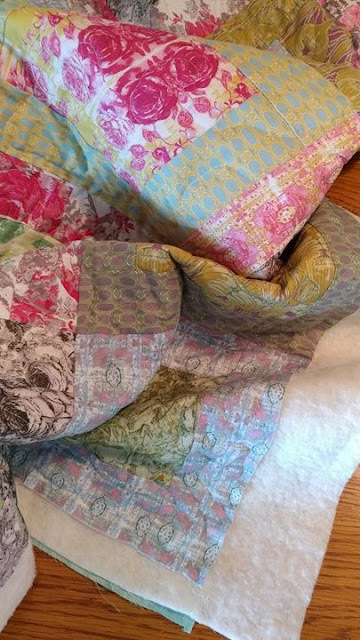 How generous and kind of you to make a full quilt for one of the displaced seniors. And thank you so much for sparking the idea with Leanne. I hope the quilts can bring some comfort. 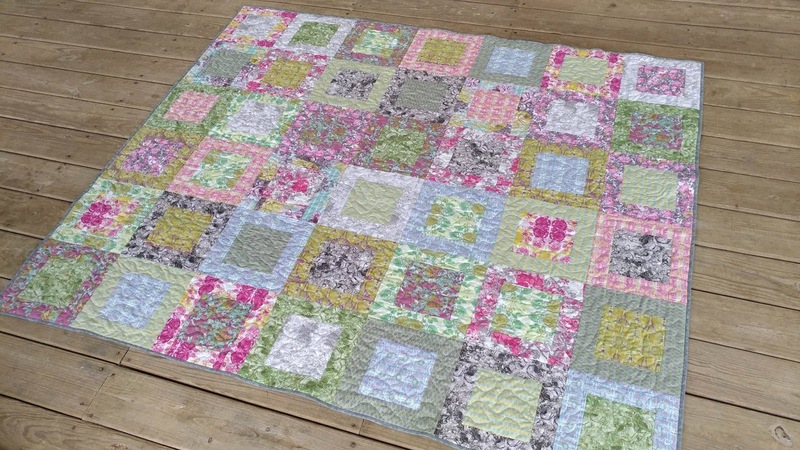 Oh wow what a gorgeous quilt for such a wonderful cause!!! That is a beautiful quilt for a beautiful cause. Thanks for sharing with us. The quilt is beautiful and will bring comfort to one of the seniors. I sent my blocks in the mail today. So beautiful and what a wonderful cause. 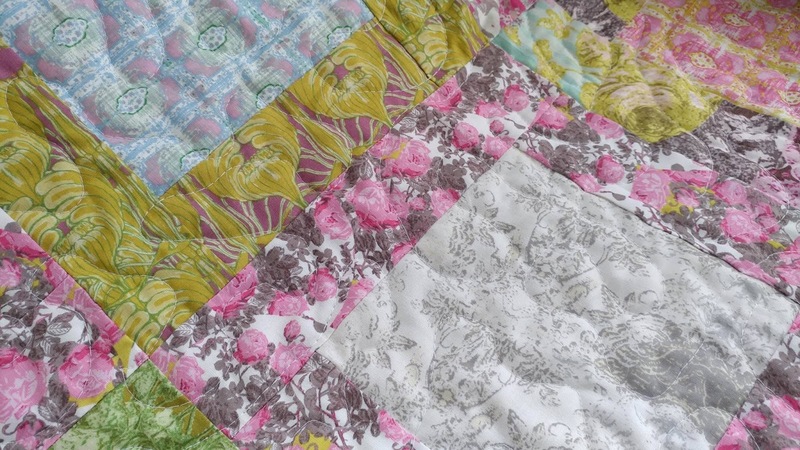 A lovely quilt! And a great cause, I'm sure it will beloved! That fabric line is so lovely Laura, and the quilt you made with those prints is beautiful! You've done a wonderful thing - someone is going to seriously love that quilt! 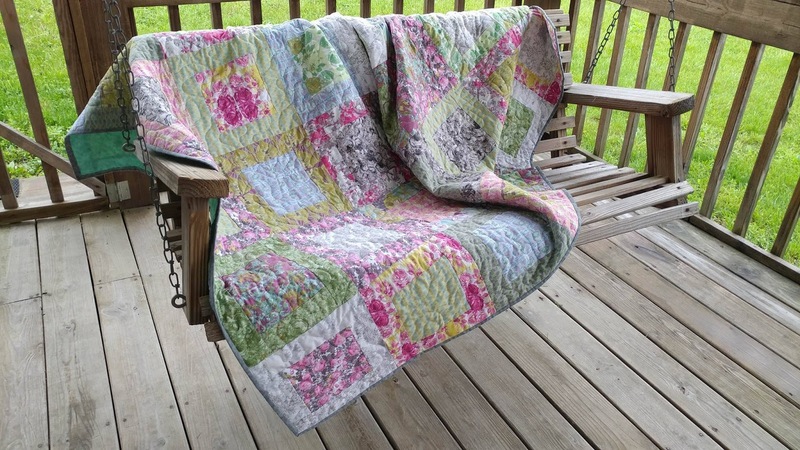 Really lovely result - love the fabrics and the quilt looks so soft and inviting - beautiful finish. Thanks for linking up with TGIFF! It's gorgeous, Laura! The colours are so soft and soothing :) I can't wait to get to pet it for myself soon, lol. Thank you for the extra binding too. 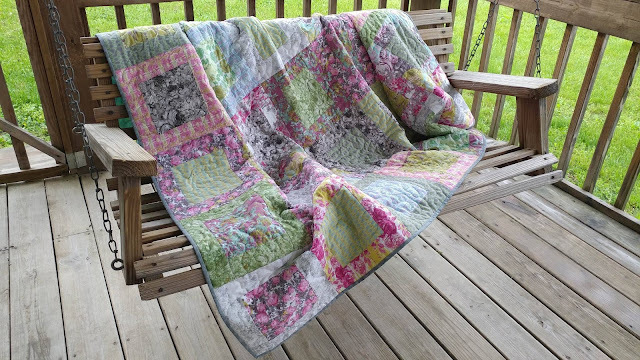 It will look great on some of the other quilts :) And thanks for sending me down this path...I'm really enjoying seeing firsthand how everyone comes together to help others. I have found the ink on the printed labels lasts longer if I use the black and white only setting on my HP printer. The black ink itself seems to be more permanent that the colors. One would think printing something black and white on the color setting would be the same, but I have found it isn't. This is wonderful! 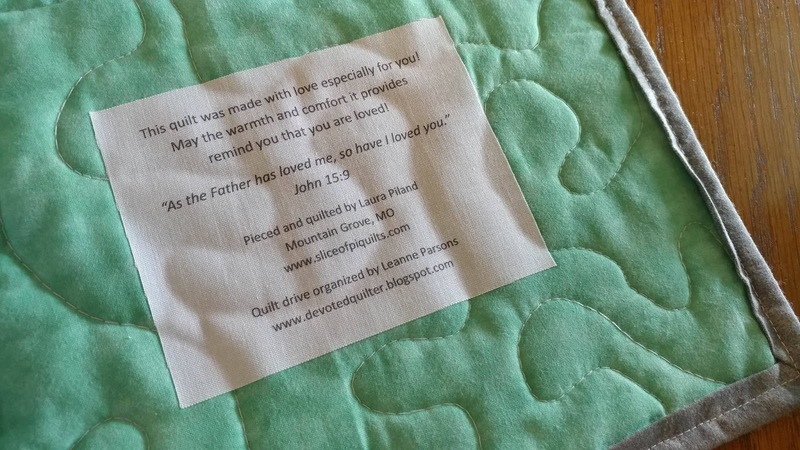 I'm sure it will mean a lot to her to receive a quilt that is completely finished and ready to gift.And it will mean even more to a resident that lost everything in a fire! Quilts are the perfect way to let someone know they haven't been forgotten.